It has been so quiet on the yurt efforts I was getting a little sad but then, just a little while ago, I got the best blog comment of all from Jennifer of Fiber Dreams. Some of the wool was done and I could come pick it up! I ran right up to NH that weekend and dragged Mary and Laurel along to get the wool. 17 pounds is now clean and made with a blend of mostly Dorset with about 4 oz of Icelandic per pound! It’s so beautiful – just like a big wooly cloud! 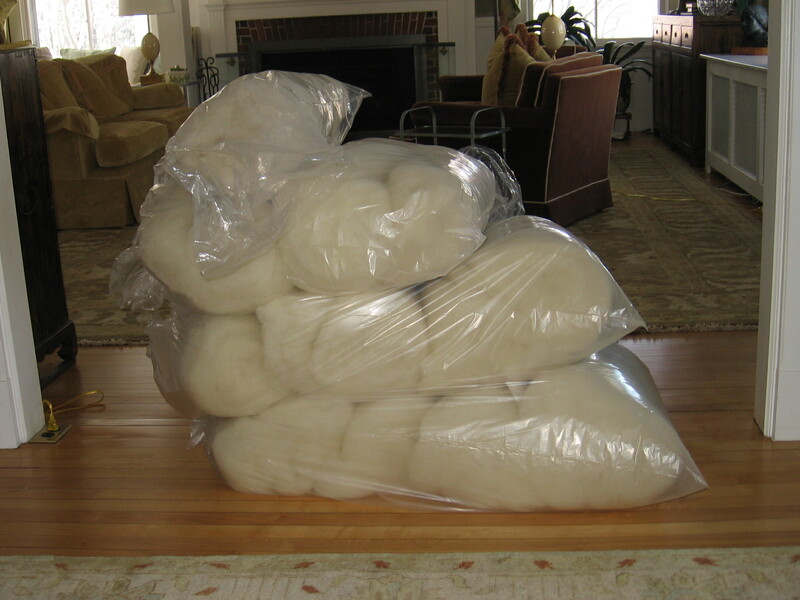 Now while that might look like a lot of batts this is JUST the beginning, there are hundreds of more pounds to go but this should allow me to make roughly 170 feet of 2.5 inch diameter cord – not a bad start! This entry was posted on Monday, February 14th, 2011 at 10:20 pm and is filed under Wool. You can feed this entry. You can leave a response, or trackback from your own site.